Elderly Pneumonia FAQ: Learn the Signs and Risks for Erie Seniors | BrightStar Care " "
If you help care for your aging Erie senior parent, then you’ve probably heard the importance of taking preventative measures against pneumonia. That’s because seniors are much more prone to catching the illness. In fact, according to a 2009 study, the annual incidence of pneumonia among adults over 65 is four times that of younger populations. Read our FAQs to learn why and get tips to identify pneumonia symptoms and ensure a speedy recovery for your parent. 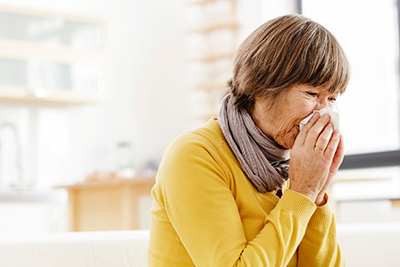 While symptoms like chills, shortness of breath, and chest pain will stand out to younger individuals, they may register as fairly typical among Erie seniors, given their already weakened immune response. As a result, a senior may not even notice the signs of pneumonia, and thus may not seek help. As we age, our lung capacity shrinks. This makes it harder to cough up sputum, the mucus our lungs secrete in order to clear infections. By consequence, infections can fester among older Erie senior adults and, worse, the mucus may accumulate in the bronchial tubes, preventing oxygen from entering the blood and cells of the body. Erie Seniors are more likely to have other conditions, such as heart disease or COPD, that when combined with pneumonia can create dangerous complications and even death. Even a mild case of pneumonia can further weaken a senior’s already weak immune system, which can turn an underlying condition, such as heart disease, into a life-threatening malady. To help your parent feel more comfortable, you can give him or her over-the-counter medicines for fever and chills. Exercise caution with cough medicines, however, as coughing helps expel mucus to rid the lungs of the infection. You don’t want to suppress coughing entirely, but if it’s keeping your parent up at night, you can get a cough suppressant prescription. BrightStar Care of Erie proudly provides support for the elderly and children, including 24 hour skilled nursing and support in senior independent and assisted living communities. Additionally we provide Medical Staffing and In-Home Physical Therapy for pediatric, adult and geriatric patients, Companion and Personal Care for Elders with Alzheimer’s or Dementia. We also provide Home Child Care, Sitter and Nanny services for Children and Support for New Mothers.